Bono carrying an umbrella. You think you are bigger than Bono, Ms. Stank? This guy is almost singlehandedly saving the world......well him and Bradgelina.....and he carries his umbrella all my himself. He should be saving his arm strength for one of those heavy microphones but instead he's holding an umbrella. Do you see how easy it is?....ok, ok...I'm sorry for sounding so angry but when I see someone who can't hold their own umbrella I get upset. 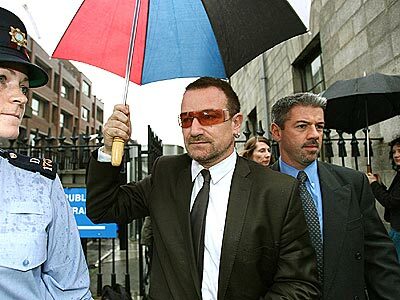 When I'm rich and famous I assure you I'll carry my own umbrella.